As we start coming into summer and warmer weather our minds turn more to cookouts in the back yard and lighting-up the grill for the family. When it comes to grilling, I think most of us turn to burgers as a family favorite! We love our burgers and fix them up many different ways. Really there are only three parts to a good burger, the meat, the seasoning and the toppings. You can choose almost anything these days for a meat, but for beef a good Angus burger is difficult to beat. I think Angus has a great flavor. Seasonings come in all shapes and sizes. I have found that a real good everyday seasoning is Weber Gourmet Burger Seasoning – it just seems to do the job each and every time. Toppings can include cheese, bacon, pickles and all the condiments your can think of. My son Christian has a favorite – cream cheese and jalapeno peach jam. The combination is absolutely wonderful, sweet yet spicy and full of flavor. This burger is a vacation to flavor town. One try and you just might be hooked as well! Impress your neighbors with a burger that is a little different than anything they have ever tried before. Grill your burgers to perfection either on the grill or the griddle, seasoning with your favorite burger seasoning. While your burgers are cooking, butter and toast your buns. Using your griddle is perfect for this. If you are using a griddle just put the burgers on one side and your buns on the other. Once the burgers are cooked, simply slather on the cream cheese and jam. You will experience a new sensation in burger creation. We hope you enjoy it as much as Christian does! As we start coming into summer and warmer weather our minds turn more to cookouts in the back yard and lighting-up the grill for the family. When it comes to grilling, I think most of us turn to burgers as a family favorite! We love our burgers and fix them up many different ways. Really there are only three parts to a good burger, the meat, the seasoning and the toppings. You can choose almost anything these days for a meat, but for beef a good Angus burger is difficult to beat. I think Angus has a great flavor. Seasonings come in all shapes and sizes. I have found that a real good everyday seasoning is Weber Gourmet Burger Seasoning - it just seems to do the job each and every time. Toppings can include cheese, bacon, pickles and all the condiments your can think of. My son Christian has a favorite - cream cheese and jalapeno peach jam. The combination is absolutely wonderful, sweet yet spicy and full of flavor. This burger is a vacation to flavor town. One try and you just might be hooked as well! 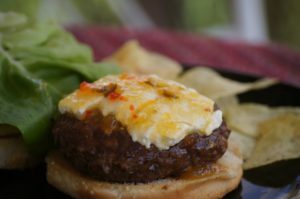 Impress your neighbors with a burger that is a little different than anything they have ever tried before.